Should the Padres trade Kevin Kouzmanoff? Overshadowed by the Adrian Gonzalez Trade Rumor Saga, the Padres have some other key decisions to make this offseason, like what to do with Kevin Kouzmanoff and Heath Bell. Kouzmanoff has quietly gone about his business, and posted three consecutive solid years, averaging just over 2.5 WAR per season (via FanGraphs). His offense hasn’t taken off as expected, but at the same time he’s improved his defense. He has very much defined himself as an average to slightly above average player. Fortunately for the Padres, Kouz is under control for the next three years (arbitration eligible), making him relatively valuable. I’m assuming free agents make $4.8 million per marginal win, increasing at 10% per year due to inflation, and that a arb-eligible player makes 40% of his free agent value in his first year of arbitration., 60% in his second, and 80% in his third (all this based on Tangotiger’s work). So, Kouzmanoff is worth somewhere in the neighborhood of $14-15 million, in my rough estimation. Obviously, that could go up or down depending on your projection over the next three years, or what salary figures you use. We’re just getting a baseline here. Anyway, he clearly has some value, and could fill in a third base hole for a lot of teams. The question remains, though, and that is still: should the Padres look to trade him? I think the answer is yes, and it is largely due to factors not really about Kouzmanoff. First, the Padres have Chase Headley ready to take over at third. Headley is younger than Kouzmanoff, he’s under control for an extra year, and he’s arguably just as good. Looking at the CHONE projections, for instance, Headley is projected at +6 offensive runs, while Kouzmanoff comes in at –2. Now, it is certainly a question mark whether Headley will put those numbers up for a full season, and if his fielding can compare with Kouz’s, but overall he’s a comparable player. By trading Kouz, the Padres can bring Headley back to his normal position at third, and go fill in the outfield with someone better suited to play there. A second reason to trade Kouzmanoff is the Padres current prospects for the next few years. They really aren’t expected to compete, so a slight – or even significant – downgrade at third is not really going to matter all that much. It might give them 75 wins rather than 77, but it likely isn’t going to cost a playoff berth. The Pads can trade Kouz to a team on the playoff bubble – hopefully enticing them to overpay for his services – and make the most out of their situation. Basically, Kouzmanoff fits better on a playoff contender, and prospects are better suited for the Padres right now, as they will hopefully be ready to contribute when the Pads begin to seriously compete again. The interesting thing here is that we could very well be having this discussion next year, surrounding Chase Headley and his potential replacements in guys like Logan Forsythe and James Darnell. The idea for the Padres here is to not worry about maximizing their expected win total in the coming season, but rather to put together a group of players that will be ready to make a run in a few years. Did Kevin Kouzmanoff deserve the Gold Glove award for best NL fielding third basemen of 2009? That’s the only question I really care about. As a Padres fan, I certainly root for the Padres and their players, but when it comes to things like player analysis, I try to be as objective as possible, setting aside my Padre fandom in a search (usually, a futile one) for the truth. Two things stand out. Kouzmanoff made a lot less errors than Zimmerman, but Zimmerman made a lot more plays. The difference in errors is important for one thing that is often overlooked: Kouzmanoff gave up very few extra bases on wild throws, while Zimmerman presumably did. However, as far as turning batted balls into outs, despite the error difference, it appears that Zimmerman is far superior, as evidenced by his 2.97 Range Factor (assists + put outs/innings *9) against Kouz’s 2.34. The difficult part of fielding analysis, however, is context. That is, determining truly how many opportunities each player had to make outs, because they were playing at different parks, behind different pitchers, and against different hitters. They certainly did not face the same exact set of batted balls, in such a different environment, so looking at their fielding stats, without adjustments, may serve us no good. What we see here is that, yes, Zimmerman did have more in-zone opportunities, in part because he played more innings, and probably in part because of some differences in context (such as the Nationals and Padres respective pitching staff tendencies). We also see that Kouzmanoff made a higher percentage of plays on in-zone chances, in large part because he was so good at not making errors. However, Zimmerman has a huge lead in out-of-zone plays, 101 to 34. Now, he also had more BIZ, so we’d assume he had more OOZ opportunities, but that doesn’t come close to making up the difference. One of the problems with an RZR-type system is that it throws all in-zone balls into one bucket, and all out-of-zone balls into another. What if, by chance, Zimmerman had a lot of balls hit right at him, and a lot hit just outside of his zone? That would probably skew our analysis. So, we can look at something like UZR, which is more precise, cutting the third basemen’s area of responsibility into many small slices, rather than one big one (it also has adjustments for park and pitching staff and so on). Simply put, it’s better. Last year, Zimmerman’s UZR per 150 games was 20 runs above average, a very high number. Kouzmanoff was at +10.7 RAA per 150. Obviously, a good rating, but Zimmerman clearly has the edge. One thing about advanced fielding stats is that we really shouldn’t look at just one year. There’s too much variability, year-to-year, to put too much reliance into a season of data. Looking at more than one year gives us a better idea about a player’s true fielding ability. Kouzmanoff, in his 418 career games at third, is about +3 RAA (per 150). Zimmerman’s RAA/150, in his 590 game career, sits at +12. Again, a relatively clear advantage to Zimm. In fielding analysis, scouting is undoubtedly pretty valuable. I don’t have scouting reports available on either player, but just about everything I’ve ever read about Zimmerman’s fielding, from non-stathead types, has said that he’s great with the glove. Kouzmanoff, on the other hand, is more of a mixed bag, rarely ever receiving too much praise for his glove-work. Tom Tango runs his Fans’ Scouting Report every year, in which fans rate the fielding prowess of the players they watch everyday. This year Ryan Zimmerman ranked 6th among third basemen in average rating, while Kouzmanoff came in at 13. In 2008, Zimmerman was 4th, Kouzmanoff 29th. The Fielding Bible asks a panel of ten experts, including the likes of Bill James, James Dewan, and the BIS video scouts, to rate fielders at each position every year. Zimmerman came in first place here, while Kouz came in 11th overall. Last year: Zimmerman 9th, Kouzmanoff 12th. After going through all of this, I don’t see any reason to suspect that Kouzmanoff was truly a better fielder than Zimmerman in 2009. Zimmerman’s advanced numbers were clearly superior, he has a better track record defensively, and he’s better from a scout’s perspective. Kouzmanoff had a fine year with the glove, and he’s come a long way in the fielding department in the last few years, but that doesn’t make him better than Zimmerman. A low error total doesn’t either, because we’re not looking for fielders who don’t make errors. We’re looking for fielders who make outs. There is always that chance that he was better, though. We can never really tell for sure. The numbers could have been off five or ten runs for each player, in either direction. But, considering what we do know about both of these guys, I think it is pretty clear that Zimmerman deserved the award over Kouzmanoff. If anything, it is far from an outrageous decision. With the offseason upon us, there is going to be a lot of player-valuation analysis for potential free agent signings, trades, and other roster moves. It’s a good time to mention that more data is virtually always better. I saw some chatter today where Chone Figgins was being evaluated as a 6+ WAR player. Figgins did post 6.1 WAR this year, according to FanGraphs. However, I don’t think there’s any reason to believe he is a 6 WAR player. Prior to this year, Figgins has been worth about 2.8 WAR per 729 PAs (the number he received this year). His last four years look like this: 2.7, 0, 3.1, 2.4. Figgins is a good player, no doubt, but valuing him at 6 wins could be a major mistake. There are multiple reasons to suggest Figgins is not at that level. 1. His past performance, as mentioned above, is a good indication that this year was a bit of a “fluke.” A great season by a good player playing over his head. 2. Regression – It’s a good idea to assume that every time a player has a great season, he’s going to come back to earth a bit next year (points one and two are a bit interrelated). Consider a hypothetical player, who put up five straight 6 WAR seasons. Still, even in his case, we’d project the player at, maybe, 5 or 5.5 WAR, depending on the exact situation. 3. His age – Figgins will be 31 next year and his game revolves around, in many ways, his speed. There is a good chance that asset will be on the decline through the rest of his career. None of this is to say that Chone Figgins can’t become a 5-6 WAR player, year in year out. He definitely could. But if we’re just looking at the numbers, and we have no special reasons to believe he’ll overcome the odds, then we’re better off taking the safer, more logical bet: That he will revert back to his old self, to some degree, and be a ~3-4 WAR player going forward. At the trade dealine, Jake Peavy was dealt to the White Sox for four pitching prospects. Peavy, who has been injured since June, may not pitch again this season until late August, at the earliest. Anyway, before we look at the details of this trade, I think it’s essential to touch on Peavy’s career in San Diego. The guy was a great asset for the Padres, and a wonderful player to watch. Peavy finished his Padres’ career with a 3.29 ERA in 1342 innings, racking up 1348 strikeouts to just 435 walks. According to FanGraphs, Peavy was 25.6 Wins Above Replacement level from 2002-2009. That performance, on the free agent market, was worth about $95 million. The Padres paid a mere $21 million for it. His time here wasn’t perfect, as he came up short in some of his biggest starts, but overall Peavy was tremendous for the Padres. At this time, however, it does make some sense to deal Jake. Peavy makes $48 million over the next three years. The Padres are a team not expected to compete for at least one of those years, if not all of them. Peavy is getting older. It adds up. Other than trading him when his value is relatively low, its probably a good time to trade Peavy. Peavy is ‘only’ worth $4.5 million in surplus value through 2012, according to my calculations. That is not considering his option for 2013 (and $4M buyout) or the draft pick the Sox will pick up when/if he leaves for free agency. There are two factors making that figure look smaller than you might have expected. One, Peavy is getting older, he likely isn’t going to be as good now as he has been in the past. Two, now he starts making the big bucks. Again, $48 million over the next three years. That’s not bad for a sure-fire ace. But for Peavy, coming off injuries and approaching 30 – well, it’s not bad, but it isn’t necessarily a bargain. Those four prospects are worth about $11 million in surplus value. So, the Padres actually made out relatively well in this deal. $11 million – $5 million = $6 million to the plus side. That is, if you trust my evaluation of Peavy, and the judgment of these prospects, and all of the other assumptions made here. There are a lot of factors involved in this type of analysis, making it much more of a fun little exercise than it is a true evaluation of the trade. Also, even if this is a “win” for the Padres, it doesn’t necessarily mean it is a loss for Chicago. The White Sox could increase their playoff chances enough to offset the apparent gap in the deal that favors San Diego. Anyway, the Padres got great production out of Jake Peavy while he was making very little money, relatively speaking. Now, when he’s going to get paid (and should gradually decline performance-wise), they ship him off for a haul of decent, if not overwhelming prospects. Yeah, that may not be how you want to look at things from a fan’s perspective, but I guess it is a business. For a small market team like the Padres to compete, moves like this may be a necessity. They can afford players up to a certain point, but once that point comes it is time to cash in and move on. It was fun watchin’ ya while you were here, Jake. Latos mixed in the off-speed stuff a little more often in start two, as he threw 65% fastballs (his first start was around 80%). When looking at any of this data, I wouldn’t get too caught up in any slight differences start to start. For instance, according to the data, his average fastball velocity dropped about one mph from start one to start two. While that could be the case, it’s also very possible that there are park effects influencing things or a pitch or two got misidentified. Anyway, the main points remain: Mat Latos has great velocity, and appears to have decent secondary offerings. There isn’t much more we could expect from his first two starts. Latos is quickly becoming one of the few bright spots in this dismal 2009 season, and he’s one reason to keep following these Pads in an otherwise lost year. You can see the fastballs clustered up top (with a change up or two), and the sliders and curves toward the middle of the graph. 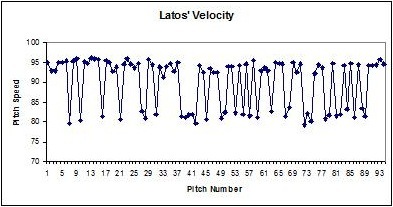 If anything, this graph shows just how much Latos relied on that fastball (about 80% of his pitched recorded by PITCHf/x). Latos was relentless with the fastball early, throwing it almost exclusively (though the camera missed a few early pitches). The most impressive thing here is the velocity – he averaged about 95 with the fastball, and almost hit 98 a few times. You can see that his fastball velocity gradually decreased as the game went on, as expected, but his last two pitches still reached 95. We can talk about movement and pitch selection and mechanics all day long – and I’m sure we will – but when a guy can throw 95+ as a starter, and has a decent idea of what he’s doing, well, there’s reason to believe the hype. One start certainly means very little, but it does show us that this guy can really bring it. That is a good thing. Two trades were made today. The M’s traded Yuniesky Betancourt to the Royals for two minor league pitchers, Danny Cortes and Derrick Saito. Baseball America has Cortes rated as the third best prospect in the Royals’ system in their ‘09 Handbook, saying he has “the ingredients to become a frontline starter.” Saito doesn’t appear in the top 30. Cortes, the prize in the deal, has taken a bit of a step back this year in AA, with a 58 strikeouts and 50 walks in 80 innings. However, he is still a somewhat promising prospect. The point is, he’s somebody. And I don’t think you trade someone of potential value for Yuni Betancourt. Betancourt has been worth a total of 3.3 WAR in his 2206 MLB plate appearances. That’s like .9 WAR for a full season (600 PA), or not very good. Since the start of the 2008 season, he’s –.5 WAR, so he’s trending downwards after two serviceable seasons in ‘06 and ‘07. He’s a guy who, at best, is probably like a 1 WAR player. More likely, he’s not even that good. Betancourt makes $3 million next year, $4 million in 2011, and he has a $6 million option for 2012 (with a $2 mil. buyout). There’s a pretty good chance he won’t be worth that much. This isn’t a terrible, franchise crippling trade or anything like that, but I’d definitely give a win to the Mariners on this one (and a subsequent “loss” to the Royals). And I’m generally very hesitant in declaring winners and losers on trades. In the other trade, the Mets acquire cash (and Jeff Francoeur) for outfielder Ryan Church. Church, who is arbitration eligible for the next two seasons, is a pretty decent ballplayer. He’s probably on the good side of average if you give him an everyday job. In a platoon situation, he’s probably better than that (though, he loses value for not playing daily). Francoeur is also under team control through the 2011 season. He is, quite simply, not as good as Church. Over the past two seasons, he’s been two wins below replacement level. Sure, he’s had a couple of fine seasons in the past, and he undoubtedly has some athletic ability, but the guy has been awful of late. He probably has more upside than Church, but more than likely Church will be the more valuable player in this trade. Nice pickup for the Braves.